ICICI Venture Funds Management Co. Ltd, the private equity (PE) arm of ICICI Bank Ltd, India’s second biggest lender, will raise $7.5 billion, or more than Rs30,375 crore, over three years to power a massive push into so-called alternative avenues including real estate, hedge and mezzanine funds, apart from its core PE business. By the end of 2010, the firm expects to have over $10 billion capital under management, a fourfold growth over the existing $2.5 billion, Renuka Ramnath, managing director and CEO of ICICI Venture said. 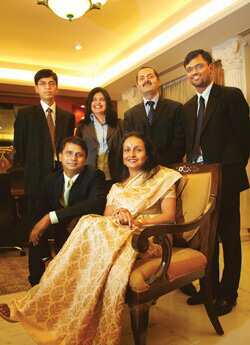 ICICI Venture and Chryscapital Llc. are India’s largest PE funds. A break-up of how the $7.5 billion will be allocated across asset classes has not been firmed up yet, but in the immediate term, a $1.5 billion generalist PE fund and an equal-sized real estate fund are in the offing. The PE fund is likely to be dubbed India Advantage Fund Series III and follows the $245 million Series I and $810 million Series II generalist funds. How are you thinking through the diversification into non-PE alternative investing? The way I think about my business is that I have the ICICI brand and as we have seen in the last 50 years, it is an extremely stretchable brand. We have put the brand into insurance, investment banking, mutual funds, information technology, business process outsourcing, and it has worked everywhere. So, with respect to ICICI Venture, I will not blind myself into saying that the brand will only work with private equity. The business that we manage here is really managing the wealth of people who allocate long-term capital to instruments that are outside the domain of standard capital market returns. So, alternative assets would include, apart from private equity, mezzanine, real estate, distressed (assets), hedge (funds) and so on. They will all be under the umbrella of ICICI Venture but as independent funds with independent teams that will operate on a non-conflicting basis for each one of our pools of investment. How much do you expect to raise overall to power this push? Currently, we are over $2 billion already. (In the next three years) we will be at least $10 billion. In that, we’ll do real estate worth $1.5 billion and another $1.5 billion in private equity, which will be a generalist fund. Mezzanine independently could be a $1 billion fund. In terms of deals, whether it is minority or majority, it will be mostly unlisted companies. We are raising these funds in anticipation of the potential, not because of any slowdown in the fund-raising environment. We are divesting our first fund (India Advantage Series I) and close to committing a very large portion of our second fund (India Advantage Series II). We need the money, so we are raising it. How will your investing strategy play out in each of these asset classes? Taking our cues from the private equity side, we will be totally broad-based in each strategy. In private equity, we do minority investments and controlling stakes in unlisted companies and listed companies. Then we did a structured offering such as (in a research unit of) Dr Reddy’s Labs and in future we will do shareholder activist plays, where we will go and take control of listed companies which are currently held in a fragmented fashion with no accountability of management. Later, whether we have mezzanine (or) a hedge fund, the operating strategy will be broad-based with a clear focus on adding value. When will you raise the hedge fund? What’s the intended corpus? We are not raising a hedge fund yet. We are currently raising a mezzanine fund. There’s a lot of potential for mezzanine deals. If you look at both mergers and acquisitions and real estate, they can guzzle up a lot of mezzanine capital. Mezzanines are taking time because of the way our regulations are. But we believe that things will change. We will start with a small Rs500 crore fund (aimed at financing) domestic deals and we will also be raising money overseas, which we will keep overseas. Any specific reason for holding the hedge fund for later? I don’t want to add too many strategies too quickly because my entire team has to assimilate it. People have to fall in place and they should be comfortable. I think we’ve done a lot for five years... Just holding on to people and moving them in a certain direction has been a challenge. So if you add too many strategies and too many people, you run the big risk of introducing chaos in the organization. Going back to the PE side, you are broad-basing your strategy there. What else is on the anvil? We added international transactions some time ago on the PE side. Since we have done it successfully in India and our portfolio companies are now acquiring companies overseas, why can’t we, as PE investors, go out and acquire companies? We would look at companies that would leverage off the India advantage. Europe is a prime target market for our international deals. Any specific sectors that you are keen on? We’ve done a couple of mining deals. Going forward, if we get comfortable with the risks associated with that business, we may allocate more capital (to it) in the next three to five years. Certainly, everything to do with domestic business excites us much more than export-oriented businesses. Retail, healthcare, financial services... Anything related to domestic consumption. Valuations in such opportunities are also attractive because there is nothing to be discovered. The black box (or uncertainty) about growth in India does not exist any more. We are also looking at manufacturing where we will buy companies overseas and bring their manufacturing to India. We don’t want to go to the complete commodity end of manufacturing but get into niches where margins are attractive and even more so if you bring in the technology. In terms of deal types, what will the mix be between growth and buyouts? Growth would still be 60% of our total deals. But my bet is that three years from now, we would have forgotten minority investments. In terms of money invested, buyouts will certainly outstrip growth deals, simply because you are putting up five times the money to buy the entire company. You will also see more leveraged buyout deals. I expect that large companies will sell. Multi-billion dollar companies will sell. Since Infomedia, how competitive has the buyouts market become? In terms of valuations, we have come to terms that there is nothing called a cheap deal. It boils down to what choices you are comfortable with making. Last night we were all here till nine looking at a buyout opportunity. We were some Rs200 crore away from what the entrepreneur was expecting. We were not comfortable at that price so we were quite happy to let go of the deal. Because it would not have been worth the effort we would have to make to earn that Rs200 crore. There will be enough deals to go around for everyone. Each player will bring in its own expertise and niche. Will your personal role change? Any new strategy, I would have to be hands-on. If we get into the shareholder activist play, for instance, I’ll definitely be very hands-on. It is important to send out the right signals. For instance, Infomedia was pretty much my decision. It is not that I went through a great consultative process within the company. I couldn’t have done that at the time because we didn’t have the management expertise on board at the time to handle buyouts. Subsequently, we set up a separate buyouts team to focus on those deals. That’s where my team has matured. They are so confident of what to do when they buy a company, how they will align the management, how they will review quarterly performance, how they will take corrective action, how will they look at balance sheet structuring and so on.Everything is very well pre-packaged. My job is to push the limits further with newer strategies.